We were invited by our friend, Mike Perrin, who we met when he was anchored next to us in Luperon, to join his friends, Peter and Louise, aboard their motor sailor, Passagemaker, to take a little day cruise along the west coast of Trinidad. 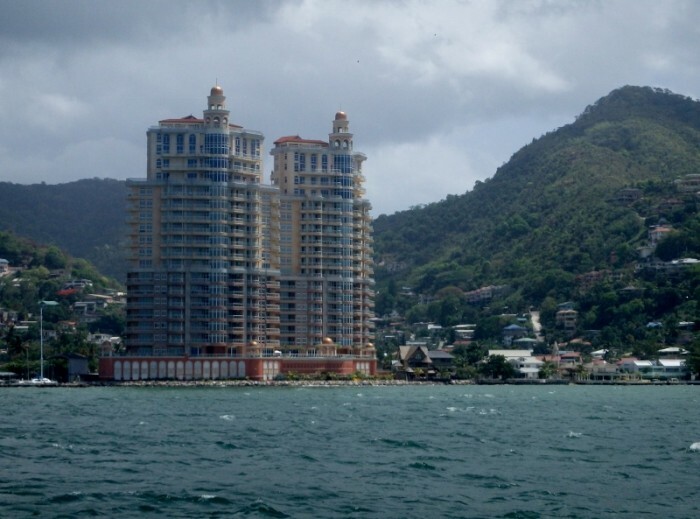 Having just arrived here a few days ago it was a great opportunity to see something besides the very busy and industrial harbor of Chaguaramas and make some new friends. Also joining us were Joe and Annie from s/v Little Wing, Mitch and Mel from s/v Private Dancer, and Mike's lovely Trini friend May. The breeze was warm as we motored along the coast taking in the sights, savoring the food and refreshments, and enjoying each other's company. On the return trip we stopped and dropped the hook in Scotland Bay, a cove surrounded by high hills, where Louise quickly dropped two kayaks into the water. Jeff and I went out for a little paddle around and came across some locals swinging into the water from a long, knotted rope hung high in a tree along the bank. We watched them take turns swinging out across the water and plunging in for a few minutes before they invited us to take a try at it. The only scary thing is thinking about it because once you're launched the rope reaches its apex where you let go and fall into the water in about a second. Fun was had by all and we returned to Passagemaker so the other folks aboard could go for a paddle. As we were leaving Scotland Bay at least eight dolphins came to swim along the bow wake, staying with us for quite some time. Many more were spotted cavorting in the water a ways in front of us and then Jeff spotted the prize of the day. A pink dolphin surfacing in the midst of another pod swimming off the port side of Passagemaker. Truly magical. Pictures during a weekend of serious fun racing our boat/home in the Heineken Regatta. Celebrating with our Luperon friends in Salinas, Puerto Rico. The journey from Bimini across the Great Bahamas Bank to Frazier's Hog Cay along with people, places, and adventure at Frazier's Hog Cay and Chub Cay. Moments in time captured with the camera. Snapshots from adventures with Bill and Steve when they visited during winter holidays. Snapshots of our road trip adventures in outlying areas of Charleston with Randy Mintken,a former Delafield neighbor who has spent the last 15 years in the Carolinas. Renewing the warm friendship made the cold and rainy weather a lot more tolerable. Great people, pets, and wild things at the hurricane party and 3 potlucks during the 16 days we holed up at Whittaker Point Marina during Hurricane Sandy and while doing boat maintenance projects. Highlights from our 25 mile trip up the Chester River and visit to Chestertown. Looked at a lot of water on Lake Erie during the journey from Cleveland, Ohio to Buffalo, New York. Took pictures from the boat while in port for the night at Conneaut, Ohio and Dunkirk, New York. Sights and fun times all along the waterfront. Our first stop on Lake Erie, this resort town on South Bass Island. Captured moments from a weekend with good friends sharing good times and good food. Going east from Lake Michigan into Lake Huron. Stayed in St. Ignace at the marina then continued on to do a harbor drive through at Mackinac Island. Photo ops from our 2 night stay in St. James Harbor, called Paradise Bay by the locals, at Beaver Island. Small wonders found while hiking. Entertaining myself taking artsy shots on the boat while motor sailing between Lake Michigan ports of Pentwater, Portage Lake, Leland, and Beaver Island. Family and friends help with the moving sale and stop by Mezzaluna to say farewell before Jeff cuts the line. Pictures of Mezzaluna and the work to bring her back on the water.